We collect information from you when you visit our site or engage in site features; including but not limited to: placing an order, registering on our website, or communications. We may ask for your name, job title, address, contact information, credit card information, demographics, or other information relevant to customer surveys and offers. We also collect information about gift recipients so that we can fulfill gift purchases. The information we collect about gift recipients is not used for marketing purposes. We use the information provided for internal record keeping, to better tailor the website and offerings to your preferences. It also allows us to better serve you, quickly process transactions, or administer a promotion, survey, contest or other site feature. The information you have provided may also allow us to send emails with information that may be of interest to you. You will not get these emails if you have not opted-in by subscribing, placing an order or registering on one of our forms; you can opt-out at any time by contacting us or opting-out from any promotional emails you get. However, order processing and update information in relation to a specific order is not considered marketing, and those emails and communications are excluded from opting-out. If you believe that any information we are holding on you is incorrect or incomplete, please email us as soon as possible, at concierge@naturallycrated.com . We will promptly correct any information found to be incorrect. When you place orders all sensitive/credit information supplied to us is transmitted through Stripe on a secured server. For more information about Stripe, please click HERE. WHAT DO WE DISCLOSE TO OUTSIDE PARTIES? We do not sell, trade, or otherwise transfer to outside parties your personally identifiable information unless we provide you with advance notice, except as described below. The term "outside parties" does not include Naturally Crated. It also does not include website hosting partners and other parties who assist us in operating our website, conducting our business, or servicing you, so long as those parties agree to keep this information confidential. We may also release your information when we believe release is appropriate to comply with the law, enforce our site policies, or protect ours or others' rights, property, or safety. Unless otherwise noted, the design of the Site, the Site as a whole and all materials that are part of the Site (collectively, "Contents") are intellectual properties owned, controlled or licensed by Naturally Curated or its subsidiaries and affiliates. Any use of the Contents without Naturally Crated's express written consent is strictly prohibited. This site and the materials and products on this site are provided "as is" and without warranties of any kind, whether express or implied. To the fullest extent permissible pursuant to applicable law, Naturally Crated disclaims all warranties, express or implied, including, but not limited to, implied warranties of merchantability and fitness for a particular purpose and non-infringement. Eco Enclose does not represent or warrant that the functions contained in the site will be uninterrupted or error-free, that the defects will be corrected, or that this site or the server that makes the site available are free of viruses or other harmful components. Naturally Crated does not make any warrantees or representations regarding the use of the materials in this site in terms of their correctness, accuracy, adequacy, usefulness, timeliness, reliability or otherwise. Some states do not permit limitations or exclusions on warranties, so the above limitations may not apply to you. Naturally Curated shall not be liable for any special or consequential damages that result from the use of, or the inability to use, the materials on this site or the performance of the products, even if Naturally Crated has been advised of the possibility of such damages. 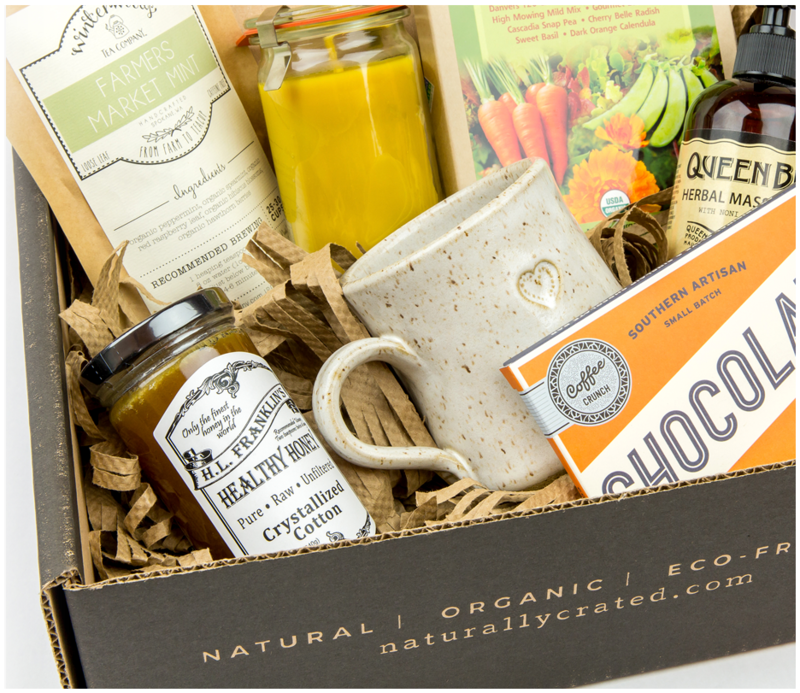 In the event that a Naturally curated product or gift box is mistakenly listed at an incorrect price, we reserve the right to refuse or cancel any orders placed for product(s) listed at the incorrect price. If your credit card has already been charged, we shall issue a credit to your credit card account in the amount of the incorrect price. All descriptions and claims are based upon the descriptions and claims of our trusted vendors and manufacturers. Naturally Crated is not liable for claims about allergens, ingredients, certifications, or any other claims that may be deemed false. Due to the use of recycled, natural, hand-made and unique materials, products may differ slightly in color, size, pattern and other variants from the website, pictures or other marketing materials and descriptions. These are not product defects and will not be treated as such. You agree to indemnify, defend, and hold harmless Naturally Crated, its officers, directors, employees, agents, licensors and suppliers (collectively the "Service Providers") from and against all losses, expenses, damages and costs, including reasonable attorneys' fees, resulting from any violation of these terms and conditions or any activity related to your account (including negligent or wrongful conduct) by you or any other person accessing the site using your Internet account. Returns are accepted within 15 business days of original purchase in original packaging only. We do our best to treat our customers fairly; we ask that our customers treat us fairly, as well. We cannot accept returns on opened or used products. We cannot accept returns on custom orders. We cannot accept returns on quarterly subscriptions. We cannot accept returns on sale items. Refunds will be given in full for products that meet the return requirements stated above, less shipping expense. Refunds are given for products only. Shipping charges will not be refunded. Processed refunds may take 5 - 10 business days to appear in your account depending on your financial institution. We will honor exchanges on any items that meet the above criteria for returns. Return shipping to Naturally Crated, and shipping for the replacement product must be paid by the customer. Items can only be exchanged for equal or greater value of the original product purchased. An invoice will be sent for the difference in cost of exchanges greater than original purchase value, and/or shipping costs incurred. Invoices must be paid in full for replacement products to ship.